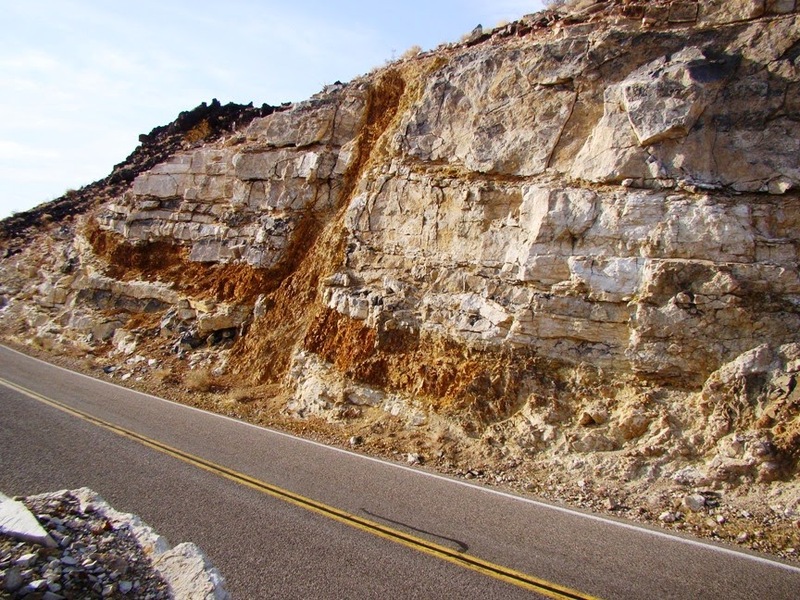 I've been working through my memories of beautifully instructive roadcuts in California. Some, like the Big Pumice Cut and the Charlie Brown Outcrop, are quite famous to geologists and generations of field studies students. Others have received less attention, and today I'm showing a particularly nice spot to learn about the difference between a dike and a sill. A dike is an intrusion of molten rock that is tabular (thin, but deep and wide, as it fills fractures in the rock), and discordant (it cuts across rock layers). A sill is also tabular, but it is concordant, meaning it squeezes between layers rather than cutting across like a dike. Highway 190 provides access to Death Valley National Park from the west at Lone Pine and Olancha. It travels around the south edge of Owens Lake, and then crosses the Darwin Plateau before beginning a steep descent into the Panamint Valley. From there it crosses the Panamint Mountains at Townes Pass and enters into Death Valley. The Darwin Plateau is capped with multiple layers of basaltic rock covering a sequence of Paleozoic limestone layers. 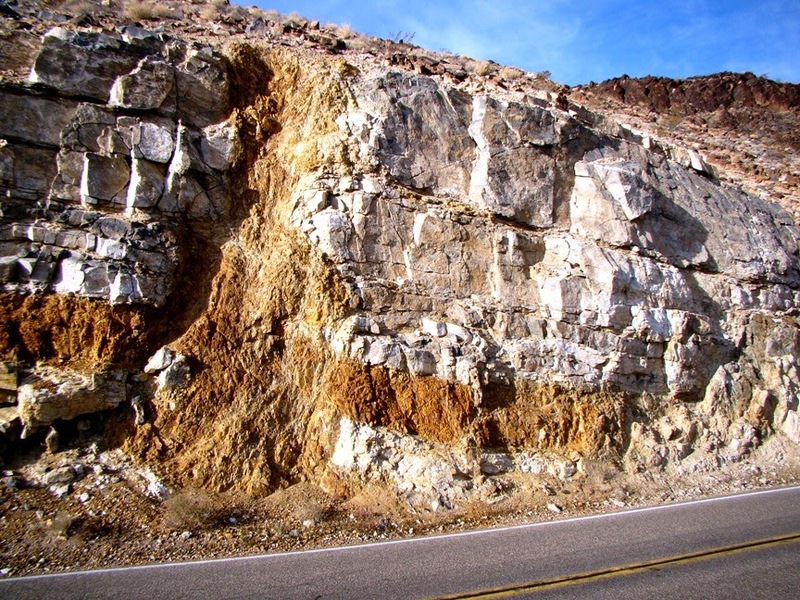 Midway down the stretch between the turnoff to Darwin and the resort of Panamint Springs there is a spectacular exposure of a dike and a sill in the same roadcut. The basaltic intrusion has been weathered to an orange-brown color. 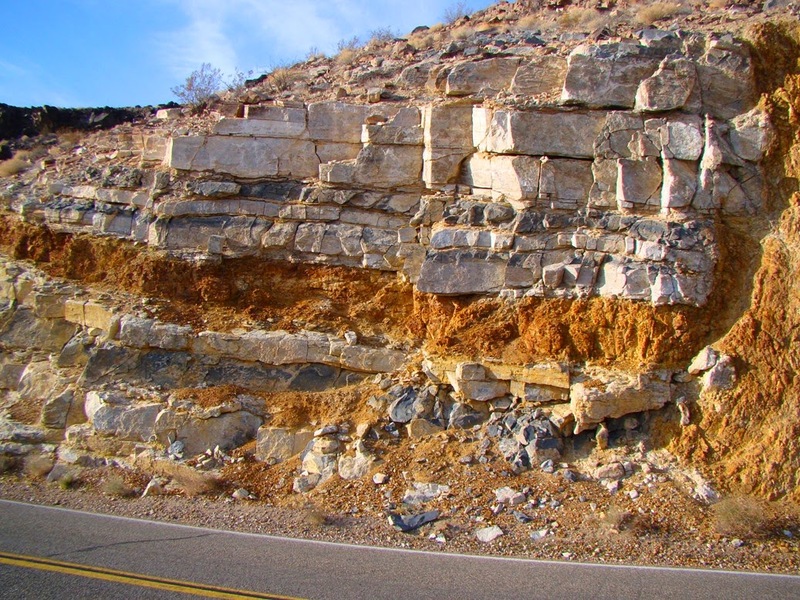 The Paleozoic-aged limestone is gray and has clearly delineated layering that makes it a straightforward exercise to distinguish the two types of intrusions that cut through it. I wish I could say that this is a favorite stop on our way to Death Valley, but unfortunately we are usually running late by the time we reach it late in the afternoon on our way to Stovepipe Wells. It is a marvelous example of both kinds of intrusions.